The Prince of Wales's Corporate Leaders Group on Climate Change (CLG), which represents EU business leaders from the likes of Aviva, Kingfisher and Unilever, has thrown its weight behind calls for an end to fossil fuel subsidies. The organisation, based at the University of Cambridge, is supporting the Friends of Fossil Fuel Subsidy Reform Communiqué, which calls on countries to realise the economic and environmental benefits of removing financial support for fossil-fuel power generation across the globe. CLG director Sandrine Dixson-Declève said: “Our members, leading businesses from across the world, are being loud and clear: end perverse fossil fuel subsidies now for the benefit of sustainable and low carbon economic development. “They recognise fossil fuel subsidy reform as an important climate-change mitigation policy with clear economic, social and environmental co-benefits. The Communiqué was formed in June 2010 to support G20 and APEC leaders’ commitments to phase out inefficient fossil fuel subsidies. It now has the backing of 13 nations including the UK, France and the US. A report released earlier this month by the Organisation for Economic Cooperation and Development revealed that rich western countries and the world’s leading developing nations are now spending up to £130bn a year subsidising fossil fuels. 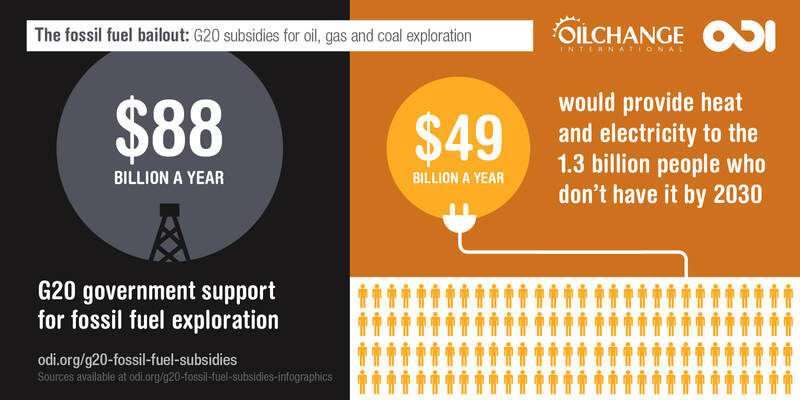 Other estimates claim that fossil fuel firms are benefitting from global subsidies of $5.3tn (£3.4tn) a year - equivalent to $10m every minute of every day. The CLG’s support for a transition away from fossil fuels came on the same day that six major US banks have issued a joint statement calling for better co-operation among global governments in reaching a strong agreement at the Paris climate talks in December. Bank of America, Citi, Goldman Sachs, JPMorgan Chase, Morgan Stanley and Wells Fargo claim their institutions are collectively “committing significant resources toward financing climate solutions” and added that “clear, stable and long-term policy frameworks are needed to accelerate and further scale investments”. The banks also expressed ambition to continue investing directly in climate change mitigation efforts to make cities and communities more resilient.